(From left) Dr. Hans Genberg, Executive Director of the South East Asian Central Banks (SEACEN) Research and Training Centre; Frank Scheidig, Global Head of Senior Executive Banking of DZ BANK; Tan Sri Andrew Sheng, Honorary Advisor of CARI; Tan Sri Dr. Munir Majid, Chairman of CIMB ASEAN Research Institute (CARI) and President of ASEAN Business Club (centre), David Marsh, Chairman and Co-Founder of Official Monetary and Financial Institutions Forum (OMFIF); Dr. Hoe Ee Khor, Chief Economist of the ASEAN+3 Macroeconomic Research Office (AMRO), and Stephen Hill, Strategic Advisor, World Reserve Trust pose for the cameras after the ASEAN roundtable series titled “What Lessons Learned from Financial Crises of Recent Times”, organised by CARI, in collaboration with ASEAN Business Club and OMFIF in Kuala Lumpur on 18 July 2018. Kuala Lumpur, 18 July 2018 – Experts cautioned that the escalating trade conflict between the U.S. and its major trading partners coupled with the strengthening of the U.S. dollar are putting pressure on the short-term macroeconomic outlook, as well as posing significant policy challenges on Asian emerging markets economies, including ASEAN. ASEAN policymakers must pursue holistic policy mix to prepare the region for potential near-term economic and financial hazards, given its high exposure to global and regional trade. Regional experts weighed in on the preparedness of ASEAN in facing a potential financial crisis at the ASEAN Roundtable Series titled “What Lessons Learned from Financial Crises of Recent Times”, which was organised by CIMB ASEAN Research Institute (CARI) today, in collaboration with the ASEAN Business Club and The Official Monetary and Financial Institutions Forum (OMFIF). The roundtable was chaired by Tan Sri Dr. Munir Majid, Chairman of CARI and President of the ASEAN Business Club. 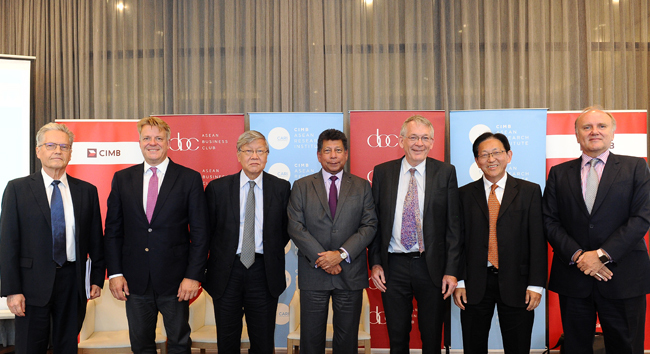 The panel of speakers at the roundtable were Tan Sri Andrew Sheng, Honorary Advisor of CARI; David Marsh, Chairman and Co-Founder of OMFIF; Dr. Hoe Ee Khor, Chief Economist of the ASEAN+3 Macroeconomic Research Office (AMRO); Frank Scheidig, Global Head of Senior Executive Banking of DZ BANK and Dr. Hans Genberg, Executive Director of the South East Asian Central Banks (SEACEN) Research and Training Centre. Panelists of the roundtable voiced concerns whether a “perfect storm” is in the making with increased uncertainties and potential spillover effects on the financial markets due to the U.S. led trade wars. “President Trump’s “America First” policy is causing global instability, in geopolitics, economies and trade. The U.S. Fed is also showing less concern than ever for the impact of its monetary policies on non-American economies. The so-called normalization of central bank monetary management, in Europe as well, has seen outflows from ASEAN capital and financial markets, the additional factor that public debt in European economies such as Greece and Italy pose a huge default risk in the banking system,” said Tan Sri Dr. Munir Majid. Learning from the Asian Financial Crisis (AFC), the ASEAN+3 Macroeconomic Research Office (AMRO)’s Chief Economist Dr. Khor said that the AFC has taught policymakers’ important lessons on crisis management and resolution. “With robust monetary policy framework and strengthening the regulatory oversight of the financial sector, economies battered by the AFC were able to weather the Global Financial Crisis (GFC) unscathed. The outlook for the region remains challenging, given the tension between short-term growth and financial stability objectives. This comes at a time when policy space has generally narrowed. In the medium term, it is important to strengthen regional financial safety net, while accelerating the structural reform agenda for a continuous income convergence in the longer term,” said Dr. Khor. Tan Sri Andrew Sheng emphasized that the true lessons from the Asian Financial Crisis (AFC) and the Global Financial Crisis (GFC) are flawed theory that failed to see the real causes of crises. However, there is political expediency to over-use monetary policy and financial regulations. “Democratic politics refused the use of painful structural reforms and taxation (fiscal tools) to address structural imbalances and social inequalities. The choice was made to over-use monetary policy and complex financial regulations that led to even more capture and concentration within the system, namely growing income and wealth inequalities, because the super-rich gained excessively at the expense of the less rich. Policy-making needs a holistic view that recognises and responds to the six mega trend shifts: Geopolitics, Geography, Gender, Geo-Climate Change, Generational and G5 Technology. These led to major, complex disruptions aggravating inequality and social losses, resulting in populist discontent.” he said. Over the past 20 years, ASEAN central banks have built up ‘buffers’ against financial crises in the form of much higher foreign exchange reserves, increased flexibility and depth of regional capital markets and lowered vulnerability to dollar-priced debt through a rise in local currency borrowing. However, with ASEAN countries at different stages of development, a major preoccupation is how to set up appropriate multi-pronged mechanisms to respond to crises ahead of time. “Irrespective of geography, policy makers must be cautious of the trigger points for crises, including political developments which are not within the purview of central banks. It is prudent to have in place contingency plans for emergency action on multiple fronts. Never overestimate a nation’s abilities to overcome its difficulties by itself – it will almost certainly need international support and lining up such action in advance can be crucial”, said David Marsh. This roundtable is the 12th edition of the ASEAN Roundtable Series.